Over 3,600 people are known to have died in a massive earthquake which hit Nepal on Saturday. More than 6,500 people have been injured. The 7.9 magnitude earthquake was the country’s worst natural disaster in more than 80 years. Members of ACT Alliance which have been working in Nepal for several years are on the ground and already working to assist many who have survived the quake, by distributing immediate life-saving supplies such as water, food, shelter and medication. Everything is still in chaos in Kathmandu, and access to information about the situation in more remote areas is limited, due to the destruction of communications channels. CWS works with partners to eradicate hunger and poverty and work for peace and justice in the world. This is another example of where you money goes when you join the CROP Hunger Walk. You can help: by click on this link. We just talked about world hunger and that which is right around our corner. Locally we walk to raise money for local agencies that help people in need. Just as important are the facts contained in this article about how public schools have become the dining room and the “last frontier” for many children to get food. While food is essential for living it is also essential for learning. Without nutrition it is difficult to concentrate and focus on learning when you are yearning for food. 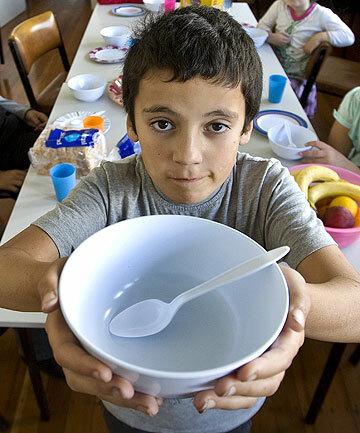 Nationwide, one in five households with children are considered food insecure, which means people in the household are at risk of going hungry or missing meals or don’t know where their next meal is coming from. Join us Sunday, May 3rd on our 32nd annual CROP Hunger Walk. Join the walk or Donate now.